Tiffany Kelly really does know a thing or two about empowerment. As one of four founding partners of RoundTable Global – a strategic consultancy focused on empowering and unlocking potential in leadership – she is passionate about creating corporations and communities that are creative and compassionate (and commercially successful). She believes that by empowering leaders to tap into both their masculine and feminine energies we can redefine social and business norms, unlock potential and ultimately create fearless cultures where effortless change will happen in the world around us. 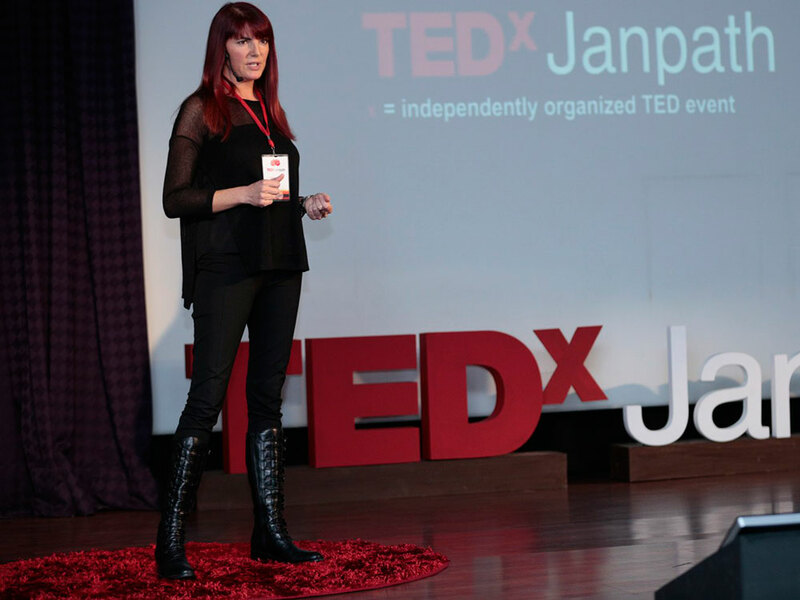 Tiffany has become an inspirational speaker leading women’s empowerment workshops and has delivered Ted Talks in Delhi and Tokyo. ‘Take 100% responsibility for everything that you do and everything that happens to you. With the benefit of hindsight everything is a learning opportunity and blaming others is disempowering. For example, I know that if I am ‘late’ for something that it is actually the perfect time to arrive even if I am not entirely sure why. Sometimes I find out the reason why and sometimes I don’t, I am happy either way. This realisation has taken away so much of my stress. I also try not to say sorry – it is basically saying that I have done something wrong or made a mistake. Instead I thank people for their patience in waiting for me. It feels different and they feel it too. Know that you are the centre of your eco-system and that if you change, everything around you can effortlessly change at the same time. Trying to change other people is not a great strategy if you are looking to be empowered. You have created them perfectly to teach you something about yourself. It is amazing to see how much the people in your eco-system change when you do – we are often holding each other in patterns of behaviour. As women we are prone to having a distorted sense of self, know that you are more beautiful than you think you are and that your ideas and passions when tapped into authentically make you even more beautiful. Step courageously into everything you are and you will inspire other people to take the journey with you. ‘Everything is possible’, ‘nothing is impossible’ are two common phrases. Many people say them but don’t live them. There is a huge difference between believing in something and living it. The fact is, everything you know today was impossible at some point. The screen you are reading this on or running the hundred meters in under 10 seconds was impossible as some point. The fact is everything is possible it is just about time. To achieve the impossible, it takes someone to step into a limitless mindset and seek solutions and inspiration rather than focusing energy on what appear to be challenges and issues. When something happens ask yourself what it is teaching you and look for the creative solution. Always be authentic and as much as possible bring everything that you are to everything that you do. Being in a ‘role’ often limits your creativity and your unique individuality. Diversity is essential for innovation. Spend some time working out what you love doing and are passionate about and do more of it. Opportunities will open up to you. Be aware of what you are broadcasting – focus on what you want and what you’re good at. You will attract in what you broadcast out. So many people don’t actually know what they want, if you can’t imagine it, how can you create it? Spend some time in your imagination and allow your subconscious to tell you what you want out of life. Daydream and dare to imagine that anything is possible. NEXT INTERNATIONAL WOMENS DAY 8th March 2016 Tiffany will be in Los Angeles running a workshop for female entrepreneurs at Soho House, which will mark the launch of the work we she is doing ‘Empowering Women to Shine’ in the USA. The focus of the workshop will be Imagination, Creativity and Play. Ahead of International Women’s Day 2016 she will be hosting her first fundraising event – an auction in partnership with Sotherby’s UK International Realty. The auction lots donated will raise funds to develop women from disadvantaged communities from around the world.